This year Blancpain has added to its Fifty Fathoms collection with a very ‘origin’ inspired model indeed, not only deciding to revive the famed disc on the dial, but to go ‘full milspec’ with the name. It can be difficult to know whether to call modern versions of vintage watches an ‘homage’, ‘vintage inspired’, a ‘revival’, or any of the other many terms that are used. Even those which appear to be straightforward design reproductions with changes that are restricted to size and movement seem to called different things depending on who you ask. 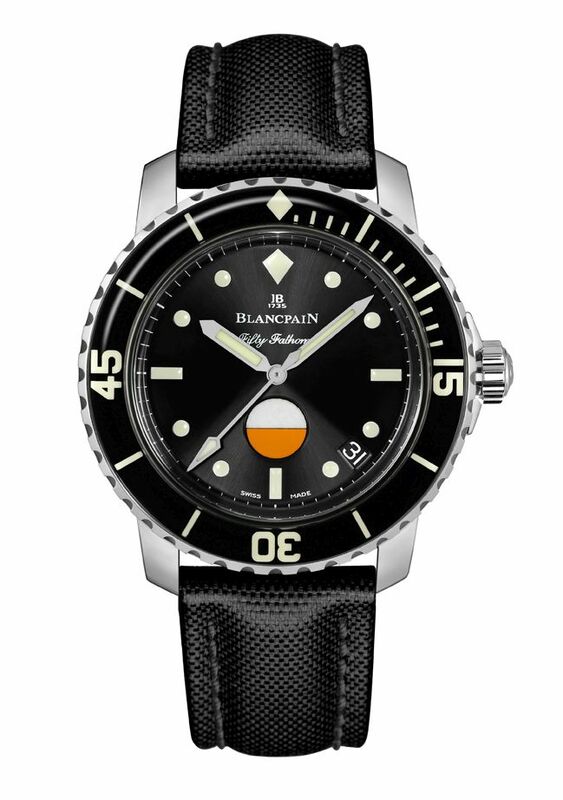 Blancpain have chosen to use the word ‘re-interpret’, and given that there were numerous variants of the original Fifty Fathoms, this seems an appropriate description. For a look at the origins of the Fifty Fathoms, for it from this that the new MIL-SPEC needs to be understood, click here on this link to read an earlier post about a rare early sample from 1954-1955. The one in my earlier post was one without the water-tightness indicator (as I mentioned in that post, the number of Fifty Fathom variants means that it is a serious work of scholarship to know its full history), but this new one is based on Blancpain’s then head Jean Jacques Fiechter incorporation of something he deemed a necessity for the safety of the diverss – a circular water-ttightness indicator that would change from white to red as a warning if liquid was leaking into the watch case. This feature was present in the MIL-SPEC 1 (for those who don’t know MILitary SPECification) model of 1957-58. 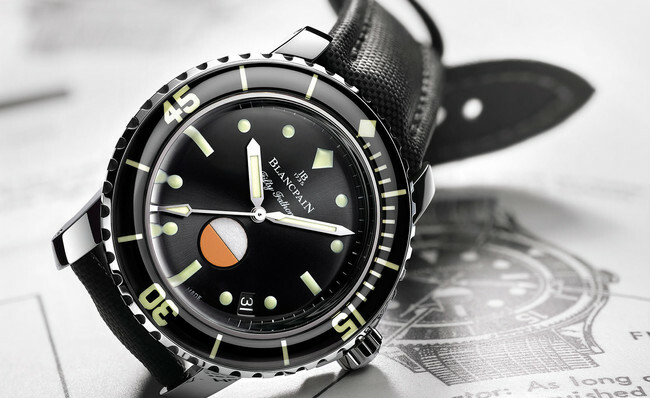 Within a decade of its launch, Blancpain’s Fifty Fathoms had been adopted by a few specialist oceanographic exploration and research organisations. Most famously, Jacques Cousteau selected the Fifty Fathoms as the dive watch of choice for his 1956 Cannes Film Festival Palme d’Or winning ‘Le monde du silence’ (The Silent World). From the early 1950s through the 1970s, the Fifty Fathoms became popular amongst the military, and used by the armed forces of Israel, Germany, Sweden, Norway, Denmark, Poland, Finland and the U.S. When the Americans were looking for a dive watch, there was a ‘Buy American’ policy, whereby American manufacturers were given a 25% price advantage over non-American competitors. Fortunately for Blancpain Allen Tornek, who had met Jean Jacques Fiechter through their common interest in diving, took an interest in helping out. To get around the various restrictions, the Tornek-Rayville company took the Fifty Fathoms and rebranded it for the U.S. military under two names ‘Blancpain Tornek’ and ‘Rayville Tornek’ (‘Rayville’, a phonetic anagram of Villeret, was the name used by Fiechter for some of Blancpain’s production). The Fifty Fathoms became the standard-issue watch on the wrists of American combat swimmers. Blancpain obtained contracts to equip members of the elite UDT and the Navy Seals with MIL-SPEC 1 watches and in the 1960s, the MIL-SPEC 2 and TR-900. The circular water indicator remained a constant. About one thousand Tornek-Rayville Fifty Fathoms were produced, most of which were destroyed by the Navy at the end of the commission, so they are particularly sought after watches. This new ‘Tribute to Fifty Fathoms MIL-SPEC’ is a very ‘modern Blancpain’ interpretation of the beloved and genuinely groundbreaking horlogical icon, with a contemporary version of the water tightness indicator. The first important thing to note, apart from the orange/ white disc which marks this as a tribute piece, is the size. It is in a 40mm case, as opposed to 45mm. This means that inside does not contain the Calibre 1315 but the automatic Calibre 1151, which is 27.4mm versus 30.60cm for the latter. 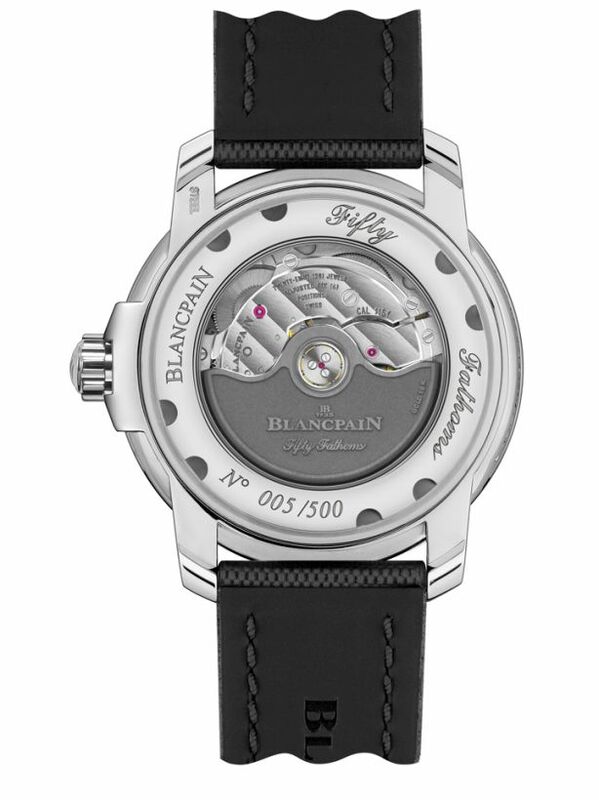 The Calibre 1151 has a gold winding rotor that has a platinum alloy coating and Blancpain logo. They have chosen to have an open rather than say a closed case back with a medalion/ engraving, so you will be able to see it all. Power reserve is four days. On the dial are the familiar design notes of current Fifty Fathoms models in terms of a unidirectional rotating bezel with luminous indications coated in scratch-resistant sapphire, the indices with Super-LuminNova, and of course the water-tightness disc. The watch is water resistant to 300m/ 30 bar. The importance and enduring influence of the development of the Fifty Fathoms in the 1950s cannot be understated. The original Fifty Fathoms is one of the few watches to have ‘icon’ status, not just as a diver/ milwatch/ toolwatch but also in how its design features have had found their way, often unconsciously, to other brands. If you are not fortunate enough to have one already, finding an original can be a difficult business indeed, so a modern interpretation is a nice touch from Blancpain. If there is one thing I’d change, and I know that I am predictable in such things, I’d have it without a date function. The size? Well the 45mm size has done well but there are those who have found it too large, and we seem to be in the middle of a trend towards downsizing watches. It is a limited edition of 500 pieces and will be offered with a NATO strap, sail cloth strap, or steel bracelet. The Australian RRP is $17,650.